Flawed Mom: Don't all men crave cloisonne on Thanksgiving? Don't all men crave cloisonne on Thanksgiving? This year, my husband's birthday falls on Thanksgiving. This happens to him every five or six years. His aunt insists she remembers visiting him and his mother in the hospital on Thanksgiving, and thanks to the godly omniscience of Google, I can confirm my husband was born the day before a national holiday. It was a heady time. Lyndon Johnson had just beaten Barry Goldwater, the Civil Rights Act had recently been passed, Sandra Dee and Doris Day were gracing magazine covers and there was a lot of speculation over who Jackie Kennedy's second husband would be. Because of the holiday/coincidence, my mother-in-law is bringing my husband's favorite white birthday cake with fudge frosting and making her world-famous sweet potato casserole. My nephew's school is having a fundraising pie sale so my sister-in-law offered to bring some pies. My mother's cooking days are over but she is bringing (and paying for) a lovely woman who used to care for my grandmother and who is going to help us clean up. All this leaves me with little to do except cook the turkey, make a couple of side dishes, set the table and find a birthday present for my husband. For a middle-aged man, his needs are pretty simple: He wants what all men want, plus a piece of cake from childhood. When I realized how much I had farmed out and how little I had done to prepare for his birthday, I started to panic. I had to find a way to make a fuss. I also needed dishtowels. So yesterday afternoon, I wandered into Williams-Sonoma. I was teaching that night and meeting a friend for a late lunch but I had time to kill. Oh, to go into a kitchen appliance and home furnishings store right before a major holiday! It was Madison Avenue, the middle of the afternoon. The sun was shining, the store was jammed, the energy was intense and the world was full of possibility. Everything looked bright and gorgeous. Ceramic bowls with pictures of turkeys painted on them! Bags of brine and apple stuffing mix! Jars of steamed whole chestnuts and pumpkin butter! I felt that rush of hysteria that quickly turns into a rabid desire for domestic bliss. Retailers know how to deal with people like me: They know we will be overcome by the clean and cozy items that speak of hearth and home. The store sends out a subliminal message: You will make everything and it will all be wonderful. Everyone will be happy! No one will ever need therapy if the tablecloth is new! There was nothing in there that screamed "Happy Birthday!" to a spouse but I immediately found turkey dishtowels and continued to surrender to the store's commands. I picked up a bag of cinnamon bun mix for my husband and examined a bag of apple stuffing. Then I spotted turkey place mats, a turkey tablecloth, turkey napkins and a turkey runner. They were all on the 15% off table. That's when I truly started to lose it. I threw them all in my basket. How thrilled everyone would be to see decorative poultry in our house! What a festive dining room we would have! Then, I saw la pièce de résistance: Cloisonne turkey napkin rings. They were so cute! They had no prices on them. I grabbed the six that were left. "Do you have any more of these?" I asked a young woman in an apron. "I need sixteen." "That's all we have," she said. "But let me call another store." I made room for the cloisonne turkeys in the plastic basket. I came up with a rationalization for these purchases: All of these turkey table decorations would jazz up the plain, white linens we had inherited from my grandmother. We have dozens of beautiful, linen napkins, tablecloths and sheer overlays from the two-family house my grandparents lived in for more than sixty years in Brooklyn. My grandmother was an elegant, frugal woman. She was one of nine children, raised by a single mother. She and my grandfather were married just weeks after the stock market crashed in 1929. She knew how to patch things up, remove their stains and make them last. Seventy years after she was married, she moved into an assisted living facility in New Jersey, just as my husband and I were buying our first house. Because I was the only granddaughter, all of Grandma's linens and silver went to me. I know there is a ton of sexism nestled in that logic but it's hard to argue with silver service for 14. When I opened the boxes that contained all of Grandma's goodies, there were piles of table linens neatly folded and pressed. Everything was white and pristine. There was not a hole or a wrinkle. My grandmother drank weak tea, sewed and ironed. She only drank White Russians, and that happened once in a blue moon when she went to a wedding or bar mitzvah. She lived her life in a calm, orderly way. Her smooth, luscious linens reflected that. Plus, she raised girls. I live my life in hyper-caffeinated rush. I am raising boys. I haven't ironed since the Eighties. My husband loves red wine. Needless to say, the minute we started to use Grandma's linens, holes emerged. Corners shredded. Coffee and wine spilled, stains remained. The turkey tablecloth add-ons and napkins rings would cover up the rips and stains. I felt so defeated. 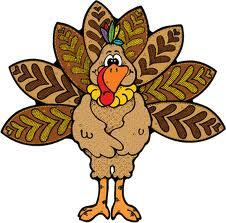 I looked down at the pretty, enameled turkeys attached to their shiny, gold rings. "How much are these anyway?" She looked them up in the computer. "$18." *$18 each?" I shrieked. They did look like enameled jewelry, but still. I removed everything from the basket except the bun mix, the dishtowels and the napkin rings. I hope my husband likes cloison,e. My mother has celiac so I don't spend a lot of time making stuffing. I buy a bag of Whole Food's "365" cranberry and chicken flavor stuffing mix. It's delicious and takes all of 5 minutes.